Alexey Lukyanuk has made a flying start to the final round of the 2016 FIA European Rally Championship on the opening two stages in darkness on the CNP ASFALISTIKI Cyprus Rally, pursued by two young stars fresh from the ERC Junior Championship. It has been a near-perfect day for Lukyanuk, who was fastest on the morning’s Qualifying Stage and chose to run first on the road on the opening mixed-surface stages. On the 11.35-kilometre DHL Stavrovouni stage (which was 64 per cent on asphalt) the rapid Russian was four seconds quicker than the opposition, and he then increased his lead to 28.3 seconds on the 21.49 kilometres of CYTANET Petrofani, 71 per cent of which was on gravel. Three weeks after claiming the ERC Junior title in a winner-takes-all decider in Latvia, Marijan Griebel is contesting his first rally in four-wheel-drive machinery in a ŠKODA Fabia R5, his prize for winning the coveted championship. Despite the challenges posed by the darkness and the mixed surfaces, the German produced a highly-impressive time on SS1 on Pirellis to be only four seconds off Lukyanuk, and only fell to third after an overshoot and a stall in the second test, which he said cost him around 15 seconds. Climbing ahead of Griebel with the second best time on SS2 was one of his fellow 2016 ERC Junior competitors Nikolay Gryazin, driving a MICHELIN-shod ŠKODA Fabia R5 for his Sports Racing Technologies team for only the second time in the ERC. The Russian who competes under a Latvian licence has enjoyed a great 19th birthday, taking second on the Qualifying Stage and occupying the same position overnight, 1.8s in front of Griebel. Gryazin’s team-mate Ralfs Sirmacis has had a much harder day. The 22-year-old Latvian is a three-time winner already in his first season at the top level of the ERC and only two points behind Lukyanuk in their fight for the championship runner-up position, but he found the night stages tough going and is fifth overall behind local ace and ERC2 leader Christos Demosthenous. 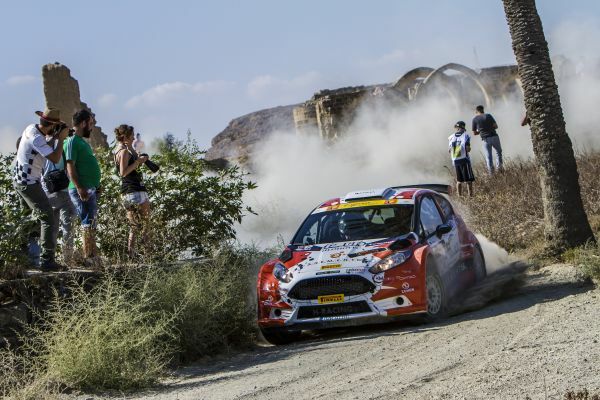 Within three seconds of Sirmacis is Lambros Athanassoulas, who is contesting the Cyprus Rally for the first time in a Team Greece Ford Fiesta R5 having twice finished on the podium of his home ERC round the SEAJETS Acropolis Rally in the last 12 months. Athanassoulas only drove his Fiesta for the first time in Free Practice this morning and reported a small brake issue during tonight’s opening brace of stages. Two more Cypriot ERC2 contenders – Nikolaos “Chips Jr” Georgiou and Costas Zenonos – follow in front of ERC regular Dávid Botka. The Hungarian was sixth after SS1, but received a one-minute penalty for being early to the next stage. Tomorrow is made up of eight stages, with three of the four morning tests repeated in the afternoon prior to the Nicosia superspecial stage that crosses through the United Nations-controlled buffer zone between the Greek Cypriot and Turkish areas. Three of the preceding tests will be all-gravel, but there’s also two runs over the mostly-asphalt 22 kilometres of Lythrodontas.